Wealthy capital cities vary greatly in their dependence on the global food market. The Australian capital Canberra produces the majority of its most common food in its regional hinterland, while Tokyo primarily ensures its food security through import. The Copenhagen hinterland produces less than half of the consumption of the most common foods. 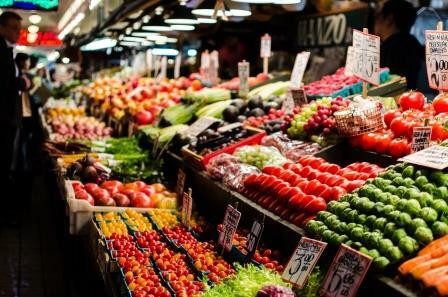 For the first time, researchers have mapped the food systems of capital cities, an essential insight for future food security if population growth, climate change and political instability will affect the open market. Several partners in the International Alliance of Research Universities (IARU) are behind the study. “The three major cities in our study achieve food security by different degrees of self-provision and national and global market trade. It is important to understand such food flows in order to relate it to the energy challenge and the risk of national political unrest caused by food shortages and its effect on the open food trade,” says Professor Dr.John R. Porter from the University of Copenhagen, who is leading author on the study recently published online in the journal Global Food Security. John R. Porter is also the main lead author of the forthcoming report from the IPCC Working Group 2 on food production systems and food security, which will be released following governments’ review, in March 2014. Higher farmland yields have influenced the cities self-provisioning over the past 40 years, but overall the ability of cities to feed themselves is unlikely to keep pace with increasing population, the research shows. Particularly in the capitals of Australia and Japan, where the population has increased tremendously over the past 40 years, the self-provision has declined; in Canberra from 150 to 90 percent and in Tokyo from 41 to 27 percent. This is despite the increase in yield of agricultural land per hectare. Copenhagen on the other hand, has increased its self-provision slightly from 34 to 45 percent because its population has remained fairly constant. “When the local capacity to supply a city declines, it becomes more dependent on the global market. As an example, Japan imported wheat from 600,000 hectares of foreign farmland to meet the demand of their capital and surrounding region in 2005. This means that large cities should now start to invest in urban agriculture especially if climate change has large effects on food production and other parts of the food chain in the future,” says John R Porter. The study has exclusively focused on the historical and current production and not considered whether changes in land management practices can increase productivity further or whether consumers are willing to limit their intake to local seasonally available goods. It did not include citizen-based production from allotments, urban gardens etc.